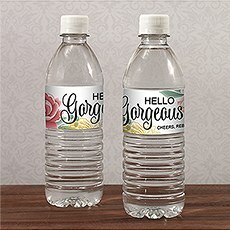 Even the water bottles can be fancy with personalized labels and plenty of color choices that will have everyone hydrating in high style. 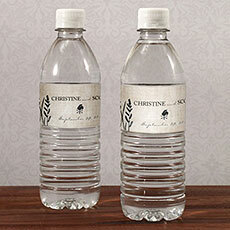 Provide fresh, thirst-quenching water to all your wedding guests with personalized labels branded with your unique theme and style. Creating custom water bottle labels is a cinch when you select any label design from our collection.Choose a DesignWater bottle labels may seem like a small thing, but they're an important part of your overall wedding decor theme. Imagine numerous bottles sitting on beautifully decorated tables. 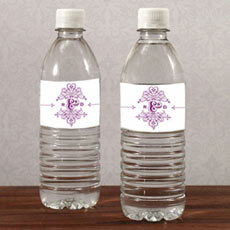 They can either stick out like a sore thumb or blend seamlessly with table decor. Of course, you want the second option, which is why we offer a wide range of decorative label designs. 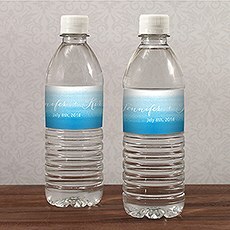 Browse our collection to find a design that closely matches your wedding theme.Label styles include classic, vintage, earthy, fun, modern and chic.Choose a ColorMany of our water labels for wedding celebrations come in a range of colors, allowing you to pick colors that best fit with your wedding theme. 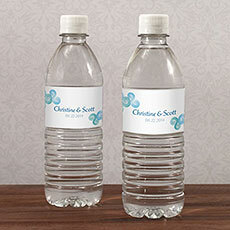 Simply click on the select color section drop-down menu to see all available options. 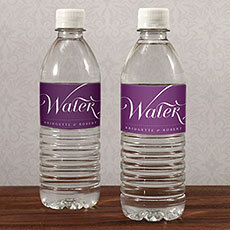 Color choices are displayed visually and by number for convenience. Click on any color option to see how a label design looks in that color. Explore as many colors as you like before making a final decision.As you browse, you'll notice some labels don't have color options. These labels are single color only, and they look marvelous.Personalize Your LabelIf you're a little nervous about the wording for your wedding water bottle labels, don't sweat it. Most people are happy they're getting water, and whatever words you choose are fine. One way to customize is to include the bride and groom's name on the first line, and the wedding date on the second line. 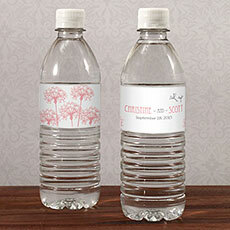 Or, opt to use the first line for a cute or meaningful saying, while placing names on the second line. It's all good.What You Should Know About LabelsYou can order DIY water bottle labels in multiples of 10. Your labels are professionally printed on self-adhesive paper, and they hold up nicely under most temperature conditions. 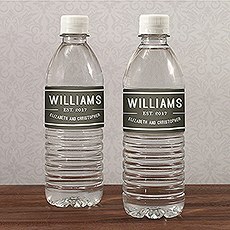 Please note that these labels may withstand minimal exposure to ice, but labels may fall off bottles submerged in water. Also, you are ordering labels only, without the water bottles.